This was to be my first long haul trip since turning the age of eighty and I was not sure whether l was really up to it, whatever 'it' might mean. After travelling for 29 hours I arrived at Bangkok Airport shattered, but no more so than on similar journeys thirty years ago. At Heathrow and Hong Kong airports l must have walked literally several miles, especially at Hong Kong, where a last minute gate change entailed walking the whole length of the vast main terminal. The immigration queue at Bangkok was immense, but fortunately there was a bypass for people over 70 which must have saved standing for at least an hour. It was 3.00pm and the Phoenix Hotel shuttle bus turned up quite quickly and whisked me over the two miles to its base, where l was able to get a couple of hours rest before going out for a meal. The nearest restaurants were in Lat Krabang Road, within easy walking distance, but the lady in reception said it would be safer to take a taxi, which she ordered for me. Lat Krabang Road is slightly 'ethnic' with eating places ranging from street stalls to proper restaurants and in my view perfectly safe to walk about, even in the dark, so I walked back to the hotel. 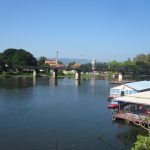 The plan was to spend the next day (Sunday) looking round Bangkok, then to collect a hire car at the airport on Monday morning and drive to Kanchanaburi, the site of the famous bridge over the River Kwai. The only problem was that l woke suddenly on Sunday to find that jet lag had struck and it was 11.00am. l was very hungry, so after another meal in Lat Krabang Road l decided to walk to the station which was on the elevated Airport Express line and go into Bangkok. However, within a couple of hundred yards l realised that it was too hot for walking and got a taxi which only cost about £1. Lat Krabang is the first station after the airport, and the train was already full, largely with people who looked like Australians, so l had to stand all the way to town. The windows were covered with little black dots, presumably to act as a sun screen, but it made it hard to see out. 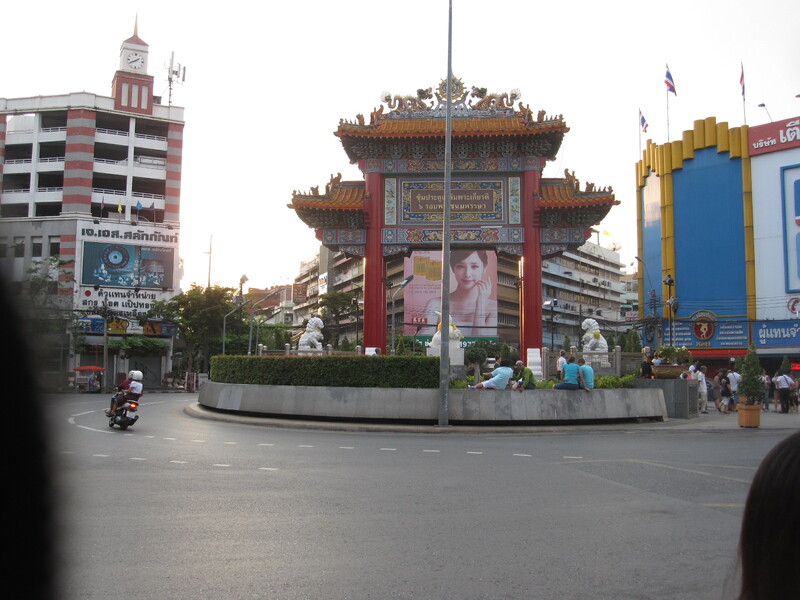 On one side of the road is a big modern shopping mall, and on other side more traditional shops including a branch of Boots, who are apparently well-established in Thailand. The road was chock-a-block with cars, vans, buses, and taxis, the only moving vehicles being tuk-tuks and of course motorcycles. It was too hot to consider walking very far and l had no plan at all for this situation. 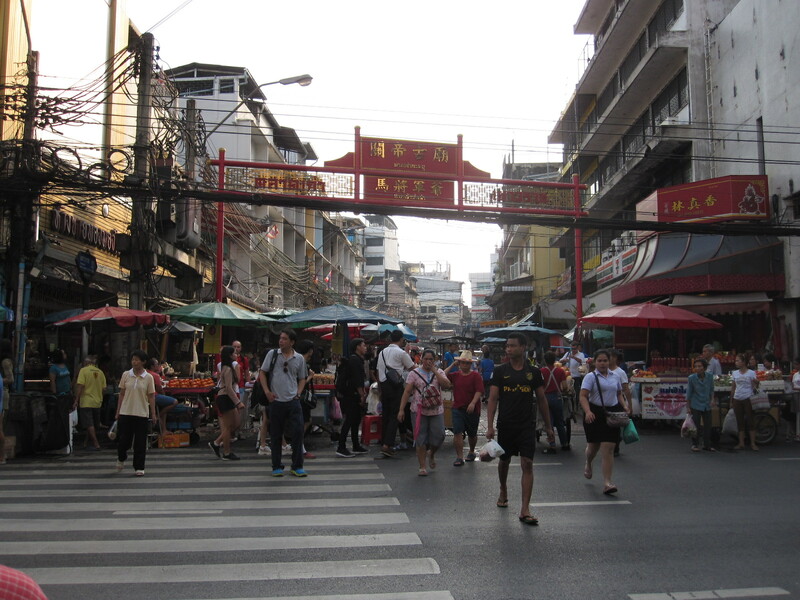 After studying the map for a while l decided to take a tuk-tuk to Chinatown, which was on the edge of the bay. The British Foreign Office advised against using tuk-tuks because of their poor safety record. The driver was clearly delighted to have a fare and after we somehow managed to escape from the jam we were soon cracking along at quite a good pace in the direction of Chinatown. It was further than l thought, but we had agreed a fare at the start so the driver had nothing to gain by taking a long way round. I always say that when you have seen one Chinatown you have seen 'em all, but this is supposed to be the biggest one outside China, taking in many streets, with some magnificent golden gateway structures. Hundreds of stalls selling everything you could think of but nothing l actually wanted to buy. The jet lag was taking its toll again, so after a look at the bay l got another tuk-tuk to Siam Square and retraced my steps back to Lat Krabang. 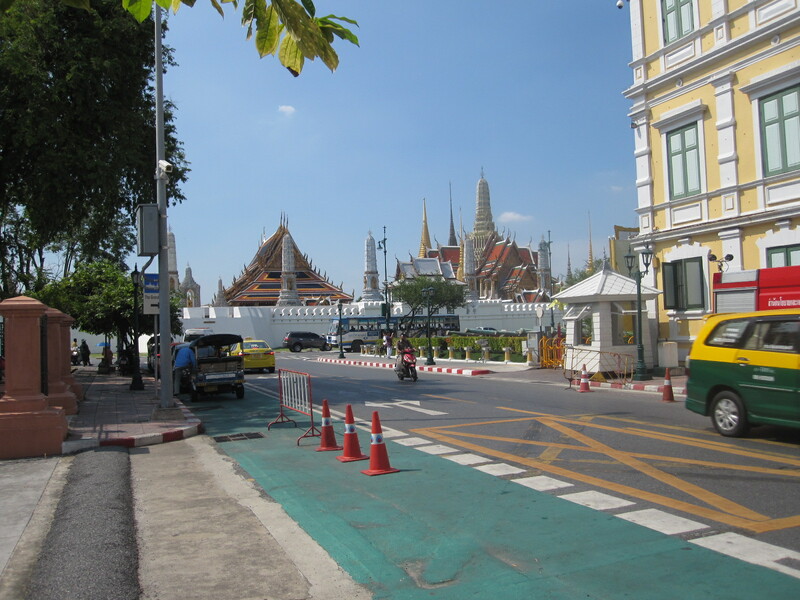 As I was committed to picking up the car on Tuesday l decided to move my full day in Bangkok to the end of the week. The next morning the shuttle bus took me to the airport to get the car from Europcar, who had a booth in the arrivals hall. 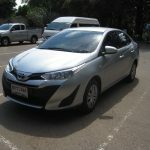 I am not sure now what l reserved, but what l got was a Toyota Yaris, actually quite a nice car, larger and altogether better than the original Yaris sold in England. It had done 25,000km but was in almost perfect condition. For this trip l had brought with me yet another item of tech, namely my TomTom satnav, a recent model in which l discovered that it was possible to put a map of Thailand. This meant I was going around loaded with tech like a teenager: smartphone, tablet, camera, action cam, Kindle and satnav, three of them having GPS. The difference is that a teenager would know how to use them all. Like some other firms, to save money Europcar use the airport service road as their pick-up and drop-off area, which means that you have very little time to get sorted. This is how l had nearly got arrested in Georgia a few months earlier. The man fixed my satnav on the screen and sent me on my way before l was pounced upon by someone in authority. 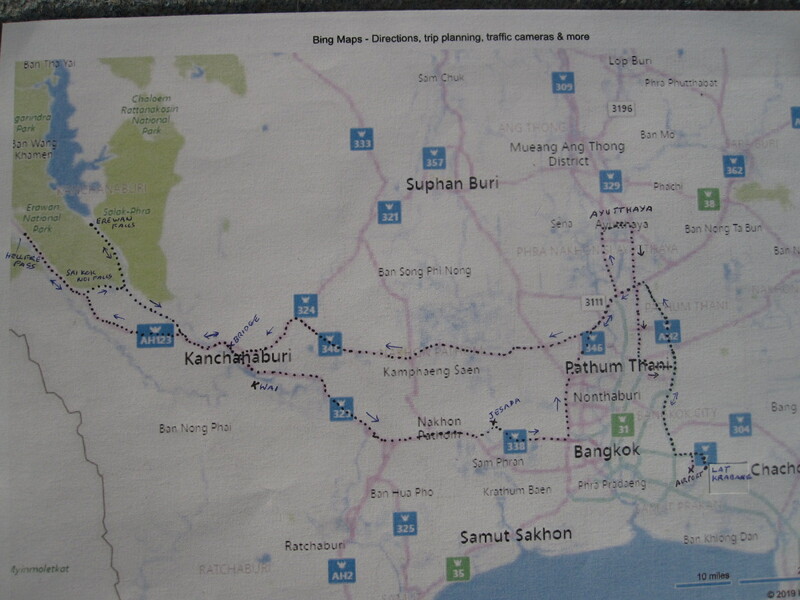 The most direct route to Kanchanaburi would be straight through the middle of Bangkok, and that is what the satnav suggested. However, having read about and seen the Bangkok traffic l decided to take the motorways around the city to the north and cut across country from there. It would be about 25 miles further but l thought it would be much easier and l think that was the case. The traffic was slow in places but it kept moving virtually the whole time. 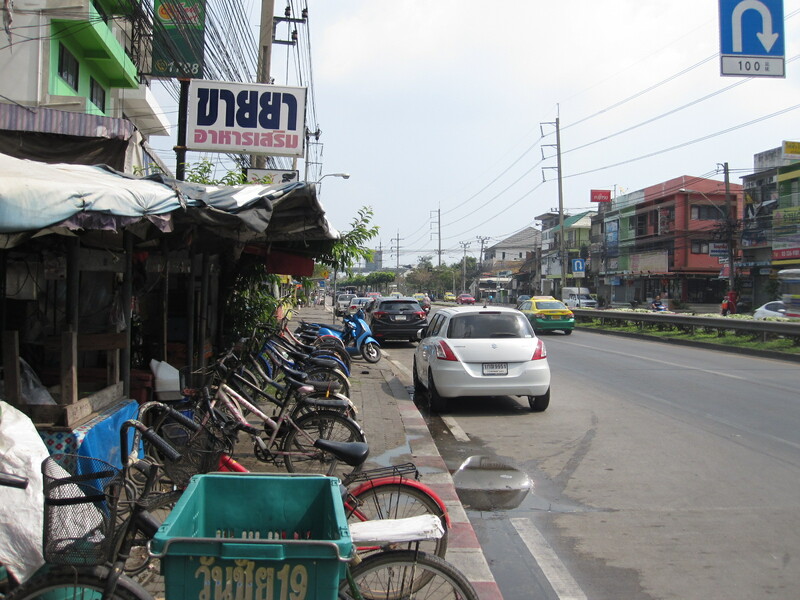 The roads in the Bangkok area are mostly not at all attractive, being solidly lined with buildings for mile after mile, including the motorways. Some of the road layouts are very complicated and many are dual carriageways in places where they would only be single carriageways in Britain. The motorway (No.9) to the north had two toll stations, 30baht (£0.75) each time, and at the first one I offered the man in the kiosk a 50 US dollar bill by mistake, thinking it was 50baht. He refused to accept it, a bad mistake for him, because $50 is equivalent to 1520baht! At the point where my route turned to the west was an incredibly complicated junction which I got through by following the road numbers on the signs. Eventually I got on to road no. 346 for an uninspiring drive of over 60 miles to Kanchanaburi, built-up most of the way. 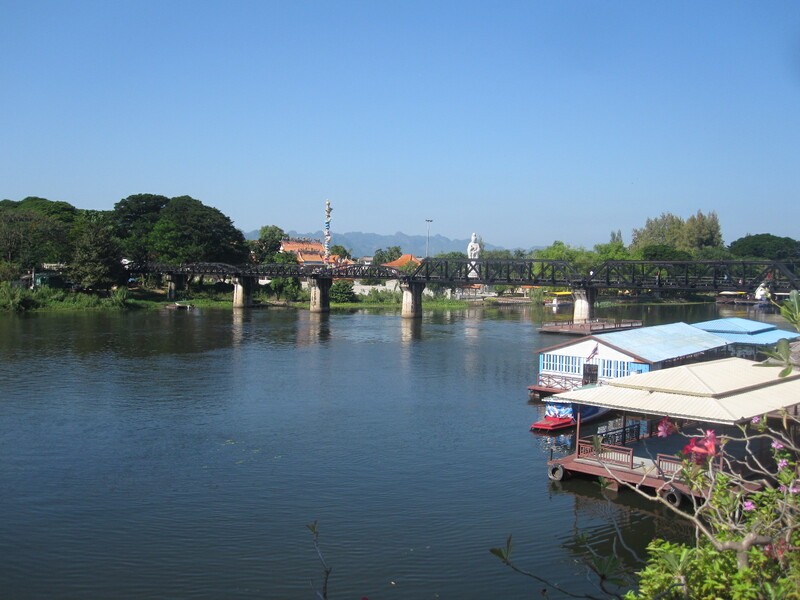 Kanchanaburi itself was much larger than I expected and the Kanchanaburi City Hotel was at the far end, very close to the bridge over the River Kwai. By now I had realized that for most things Thailand is very cheap by our standards. 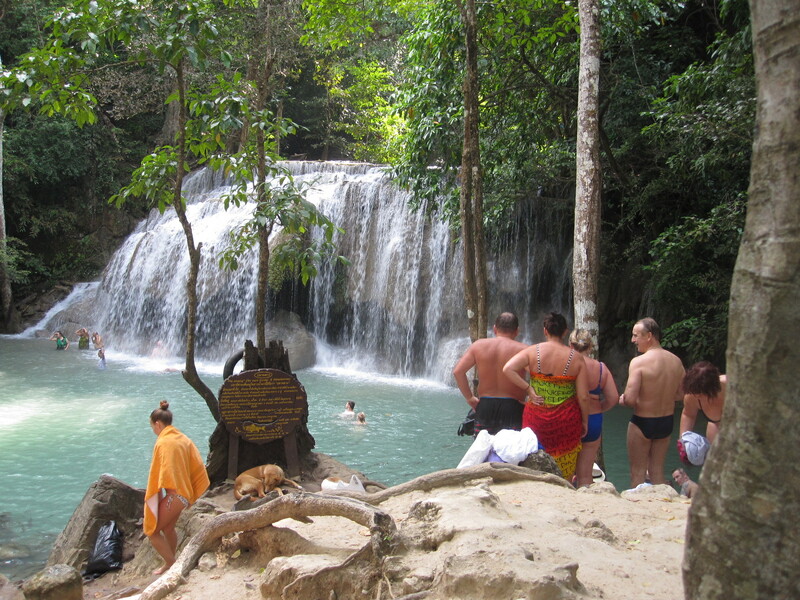 The Phoenix hotel in Lat Krabang was £21 per night, and the one in I had just arrived at was £35. It was really quite good, with a decent restaurant attached. 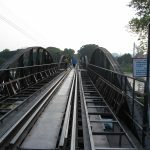 The first thing I did was to walk along to the bridge, a steel structure with a single-line railway track still used by tourist trains with diesel locomotives. The sections at the ends with curved sides are from the original steel bridge built by POWs in 1943, and the two centre sections with straight sides were built after the war to replace those destroyed by allied bombers in 1944/45. On Sunday afternoon there were lots of people around, walking on the track and over the bridge, so I joined them and set off to walk across the river. Within a short time people started shouting and I suddenly realized that they were shouting at me, because a train was approaching. Fortunately there are platforms about every hundred yards to provide sanctuary for those stupid enough to get in the way of the trains, which travel very slowly. It is said that one man died for every sleeper on the Burma Railway, which is a sobering thought when you look down at the track. 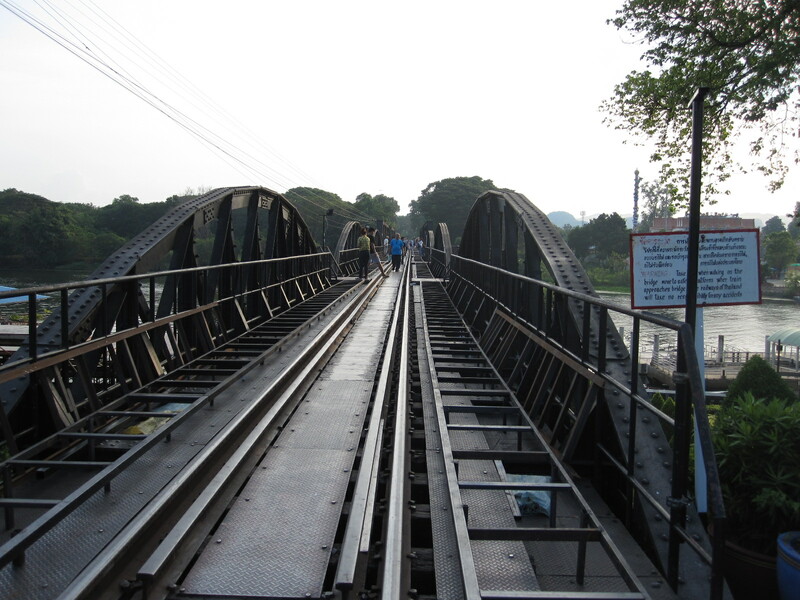 Before going to Thailand I watched The Bridge on the River Kwai and The Railway Man. The former is largely fictitious and was shot in Sri Lanka with much more dramatic scenery than Kanchanaburi, and the latter was more factual, but I do not think that either comes close to bringing home the horror of actual events. 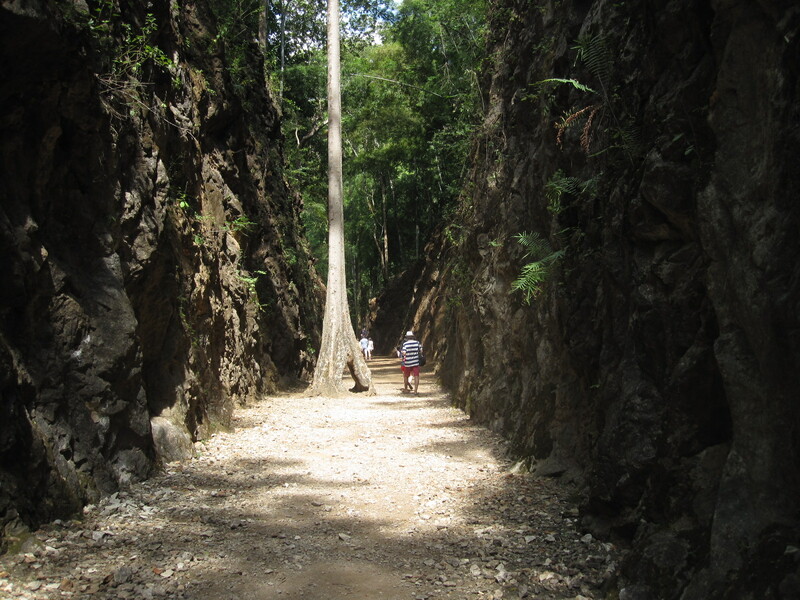 Construction of the Death Railway from Thailand to Burma was started in September 1942 and finished in December 1943. Approximately 30,000 allied prisoners of war and 200,000 impressed labourers from far eastern countries were forced by the Japanese to work on the project. More than 16,000 POWs and 100,000 other labourers died, mainly due to starvation and lack of medical care. 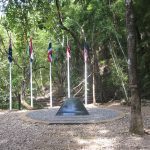 In Kanchanaburi there are two JEATH war museums, JEATH standing for Japan, England, America and Australia, Thailand, and Holland. The name was deliberately chosen for its resemblance to DEATH. 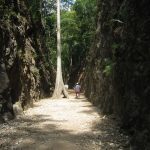 I decided to spend a day venturing further into the Kwai valley to look at the Hellfire Pass railway cutting and two famous waterfalls before visiting the museums. Eventually the ribbon building finished and after about 40 miles I came to the Sai Yok Noi waterfall which was immediately next to the highway, with souvenir shops and cafes opposite. A path led up the hill with the main waterfall cascading into a pool and then dropping further down the hillside. It was a pleasant sight but hardly one of the Wonders of the World. 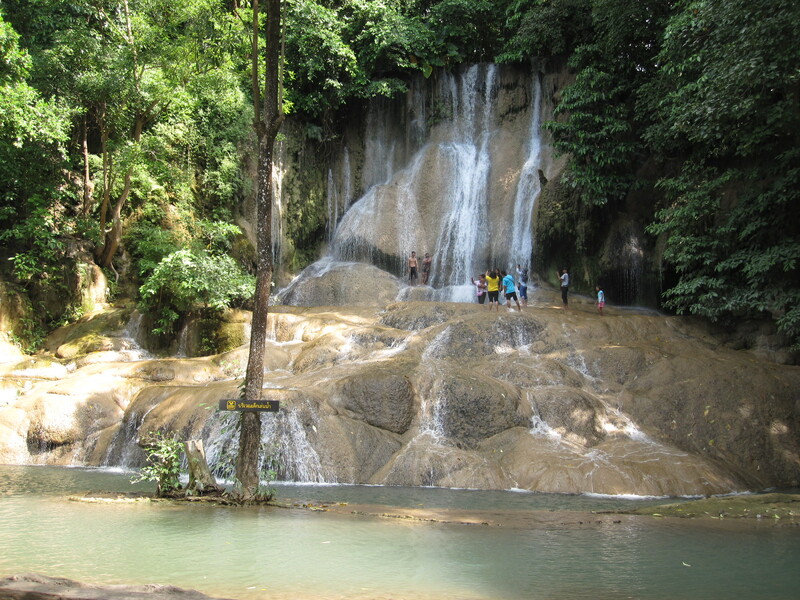 I did not discover until later that there is another waterfall, the Sai Yok Yai, some miles further on, but from pictures it does not appear to be significantly more spectacular than the Sai Yok Noi. Next stop was Hellfire Pass, which is what I had really come to see. The pass is a deep cutting through rock, made with hand tools by allied POWs and forced labourers from other countries, working up to 18 hours a day. 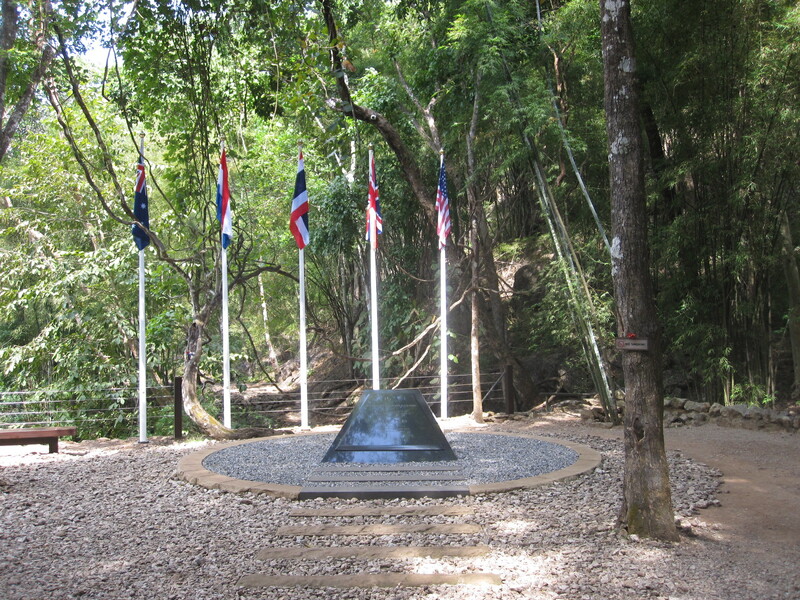 The name comes from the sight of emaciated prisoners working at night by lanterns and torchlight, which was likened to a scene from hell, and in the 1980s some former Australian POWs convinced the Australian and Thai governments to make a permanent memorial at the site. mature tree growing in the middle of the cutting which is at the base of a heavily wooded hillside. The temperature was about 30⁰C at the time of my visit and I had applied DEET (which I hate) to the exposed parts of my body in expectation of being attacked by insects, but surprisingly few were in evidence. As I climbed the hundreds of steps back to the car park I could not help thinking of a friend who had recently dropped down dead walking up a steep mountain path in Switzerland. After the pass a 40-mile loop by road took me to the more spectacular Erewan Falls higher up in the valley. These have seven levels with a pool at each one, all within heavily wooded terrain. The first four levels are reasonably easy to reach on foot, but that is as far as I got. 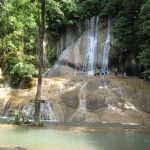 It was quite clear that most people go there with the intention of getting wet, treating it as a water park and swimming in the pools. 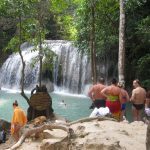 I returned to Kanchanaburi by a different route (3199) which was just as built up for the last 40 miles as the way I had come. 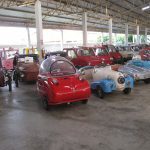 The plan for the next day was to visit the two JEATH war museums and then drive to a historic town called Ayutthaya, via the Jessada Technical Museum at Nakhon Pathom. One JEATH museum was directly opposite to my hotel, and was certainly entertaining. 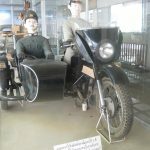 It contained a vast number of exhibits which claimed to be from World War 2 but many were in fact from the early post-war period. There were cars, motorcycles and other things from the late 1940s and 1950s, but I think it was well-intentioned effort, just not very thoroughly researched. From there I drove into the town centre, where I was able to park at the roadside for as long as I liked with no restrictions and walk to the other JEATH museum. This was a more serious effort altogether, built and operated by an adjacent temple. It consisted mainly of two buildings, one of which is a reproduction of a thatched prisoner of war hut lined with large photographs taken by the prisoners themselves together with their own detailed accounts of the conditions in the camp. It did not make pleasant reading. I find this rather difficult to come to terms with, because for almost 50 years I have had a close business relationship with a Japanese company, and have visited Japan twice. It is quite hard to reconcile my personal experience of the people with the irrefutable historical facts, but facts are facts. 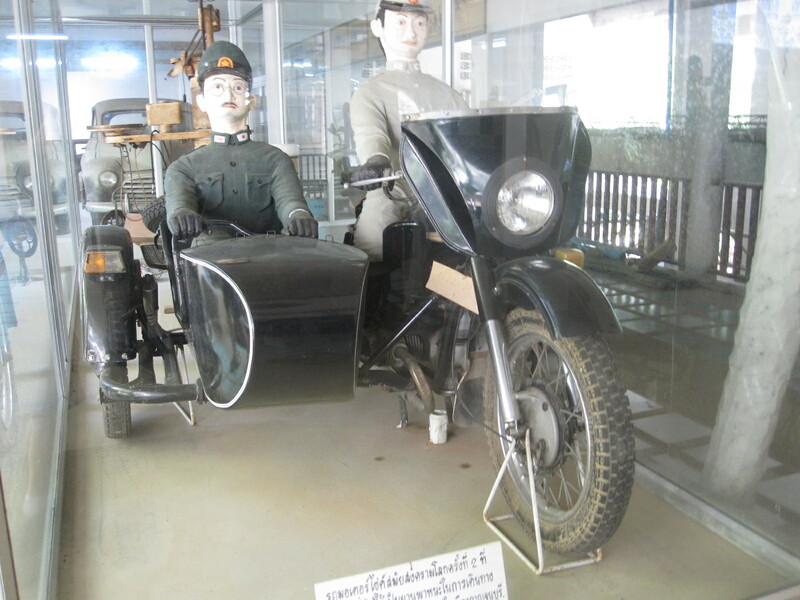 The Jesada Museum at Nakhon Pathom, about 80 miles away, was a different matter. Largely dedicated to transport, it had one of the best car collections I have been to, mostly from Europe. 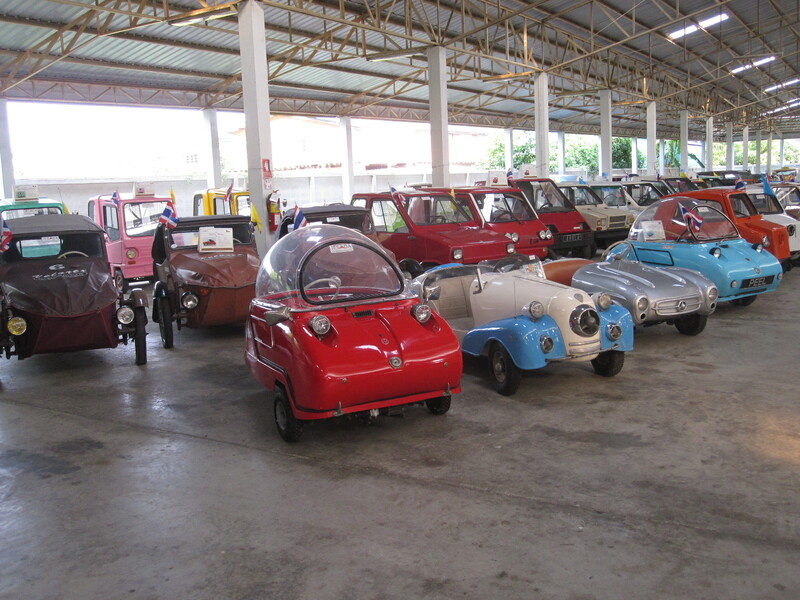 Wonderful micro-cars, motorcycles and all the things I would wish to see in such a museum. It is hard to imagine how they got there, but there they were. 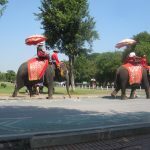 By the time I left the museum it was late afternoon and I had a long way to go to Ayutthaya, especially considering that I had to drive some way into Bangkok before taking the motorway northwards. 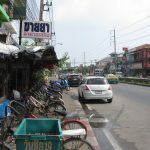 By the time I got to the motorway it was dark, the traffic was quite heavy and I started to experience some of the things I had read about – vehicles with no rear lights and lunatic motorcyclists, made worse by the complete absence of road lighting. 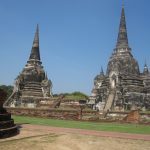 I turned off and tried to find a couple of hotels that were shown on the map in my tablet, but they did not seem to exist, so I decided to press on to Ayutthaya where I imagined that there would be plenty of accommodation. When I got there it was very much the same story and just as I was becoming resigned to sleeping in the car I found a big hotel called the Riverview which was packed with people but they somehow managed to find a large room with a balcony for me. Apparently there was a festival in the town and a big military conference in the hotel. 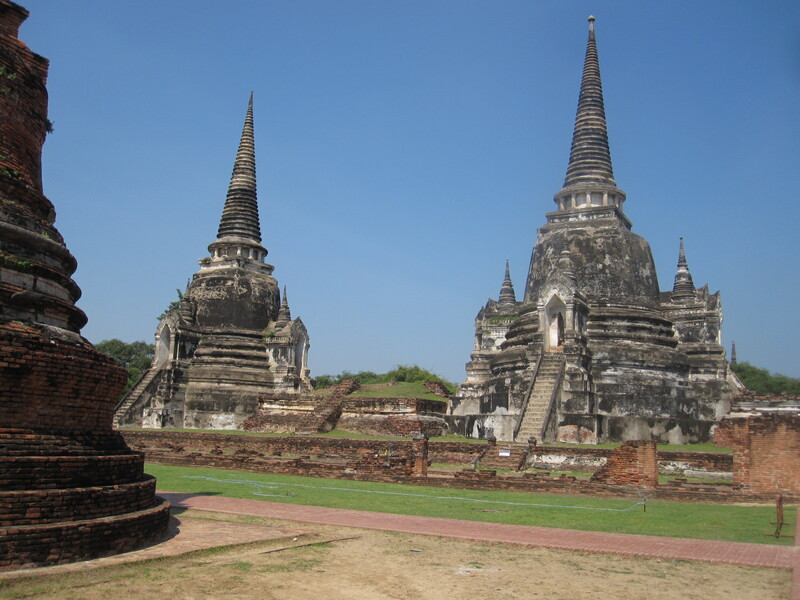 Ayutthaya was once the capital of the Kingdom of Siam and the ruins of the ancient city are preserved as a UNESCO World Heritage Site in a park. At 10.00am it was quite hot and entailed a fair amount of walking, but it was exactly what I had expected to find, four classical temples and other ruins standing in a canopy of ancient trees. The temples all have astonishingly long steep open flights of steps which must surely have reduced the life expectancy of those worshipping in them. There was also a more modern building in the traditional style with an enormous golden Buddha figure in it that I could see from the doorway, but I could not go in because I was wearing shorts. 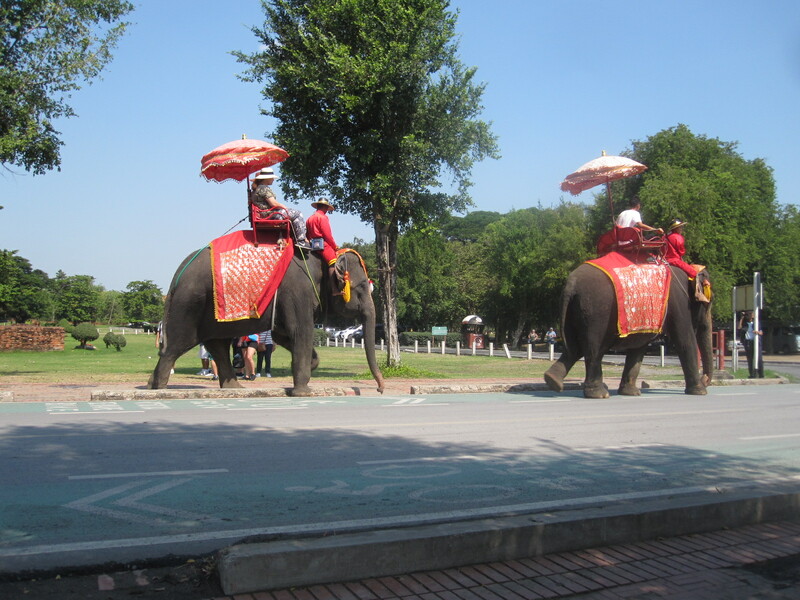 Rides on highly decorated elephants were another attraction in the park, but I decided to give that a miss and go the vast market shown on a map obtained from a lady in the nearby tourist office. As always there were lots of interesting things but nothing that I wanted to buy, so I set off on the way back to Bangkok. The route took me through the complicated road junction that I had successfully passed through using a map two days earlier. This time I put my faith in the sat nav, which was a disastrous mistake, as it eventually took me through a narrow tunnel with about seven feet headroom and six inches of water on the road. By time I got back to the correct motorway I had done about ten extra miles. Using the hotel WiFi in Ayutthara I had booked a hotel called Mariya near Lat Krabang Road but some distance from the Phoenix. By the time I got to the area it was dark and the traffic was frantic, with motorcycles weaving in and out making it impossible to stop to check my position. The hotel was in one of many side roads which all had complicated numbers with suffixes instead of names, and after driving up and down three times I gave up, intending to look for somewhere else. Then I suddenly recognized the road with the Phoenix in it, and booked in there for two more nights, wondering why I had not done that in the first place. Square was still totally gridlocked and it took an age for the bus to get underway. 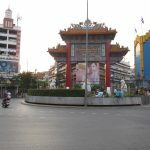 Eventually it did, and after passing Hua Lamphong railway station which is very reminiscent of Kings Cross it went through Chinatown, Little India and on to The Grand Palace, where I got off. The Palace was closed, as major attractions always are when I arrive, but at least I managed to find a toilet in the adjacent barracks. The Palace is surrounded by a high wall and it is virtually impossible to get any photographs. It was too hot for walking around, and the next bus did not come for about 45 minutes, so the bus tour was not really a very good idea. It continued past many other sights including the Marble Temple and the Giant Swing, but I did not get off because of the long wait of up to one hour for the next bus. 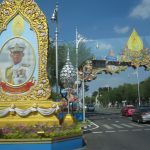 An interesting feature of Bangkok are the huge pictures of members of the royal family displayed at road junctions and other prominent places. The royal family is held in high regard and guide books point out that the law of lese majesty (disrespect in any form) is taken very seriously and heavy punishment applies to foreigners as well as nationals. Back at Siam Square I had a meal and looked round the Paragon multi-storey shopping mall which is clearly aimed at foreigners with a lot of money. 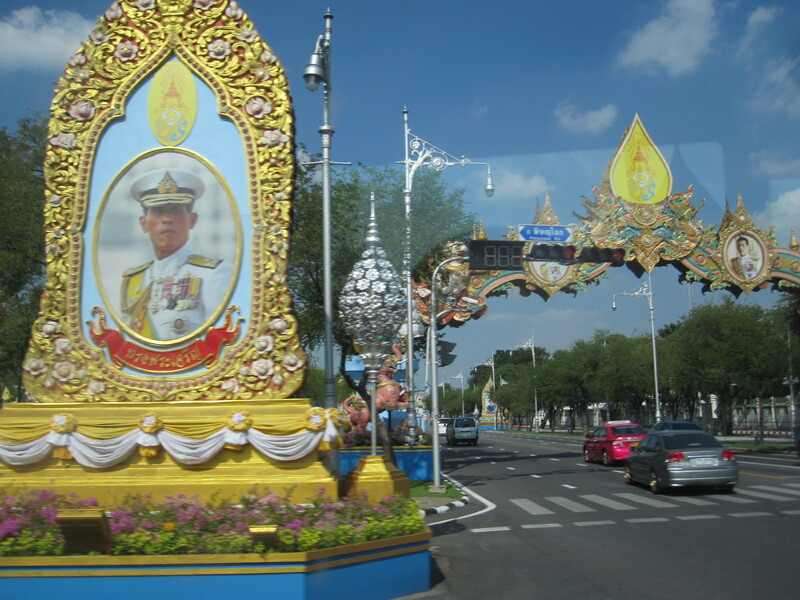 I was rather disappointed with my day in Bangkok, because it was too hot for walking far, and the bus tour was not very good. The best way to see the city would be by bicycle if you are fit or rented scooter if you are used to riding in heavy traffic. 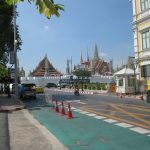 There are, however, warnings about scams with motorcycle rental and the British Foreign Office advises strongly against it..
Perhaps the highlight of the holiday was the motorcycle taxi journey I took from Siam Square to Phaya Thai station. In front of the Paragon shopping mall was a small motorcycle taxi area with riders in official tabards with numbers, offering their services. 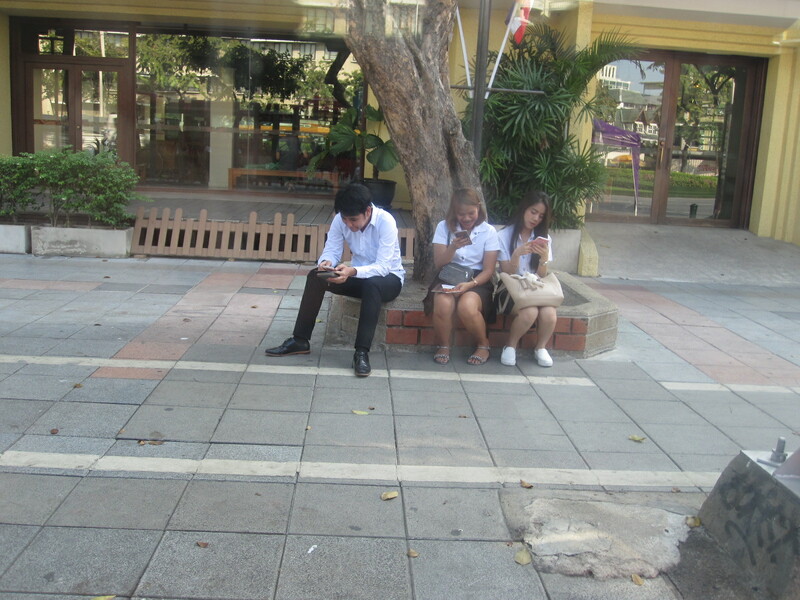 One of them approached me and I asked how much it would be to Phaya Thai station. He said 100baht (£2.50), so we set off through the near-stationary traffic on his smart-looking scooter, with me on the back holding my action cam pointing over his shoulder (he had agreed to let me film). He had given me a flimsy open-face helmet to wear, but otherwise I had no protective gear. I often ride motorcycles in heavy traffic in England so it was not too much of a culture shock as we weaved in and out of the cars and rode on the wrong side of the road against oncoming traffic. You can only die once, but sometimes it seemed like more than once. 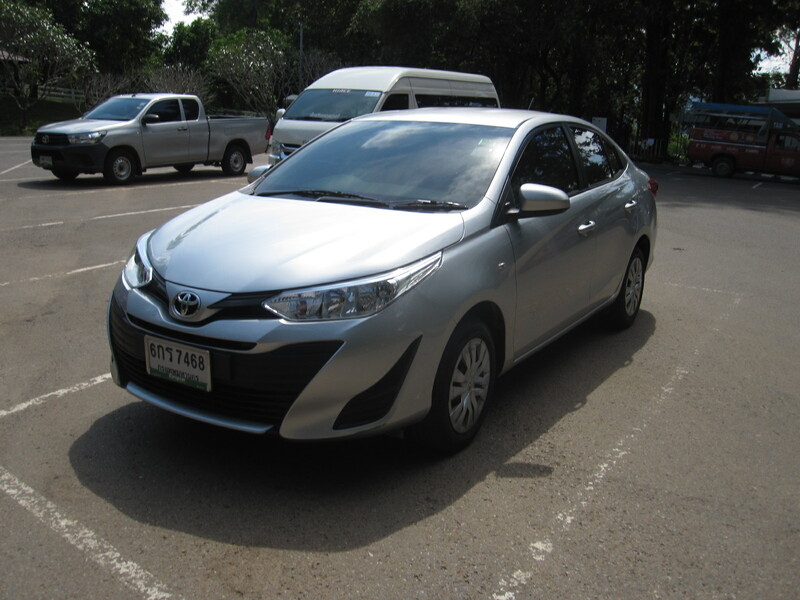 The ride was everything I had hoped for and I gave him 200baht. The next morning the shuttle bus took me to the airport for my flight to Hong Kong. The flight was only about 3 hours and on arrival I had to complete an immigration form but was disappointed not to get a stamp in my passport. All that way, and no stamp. As I did not intend to get a car I had booked for 3 nights at the Casa hotel in Nathan Road, Kowloon, right in the centre of the city. 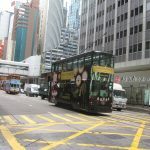 The guide book advised getting a bus rather than the train from the airport because the bus goes over some high bridges with wonderful views, and also runs through the areas with most of the hotels, including Nathan Road. Hong Kong is spread out within an area of about 30 miles square, but at least half of that is water. 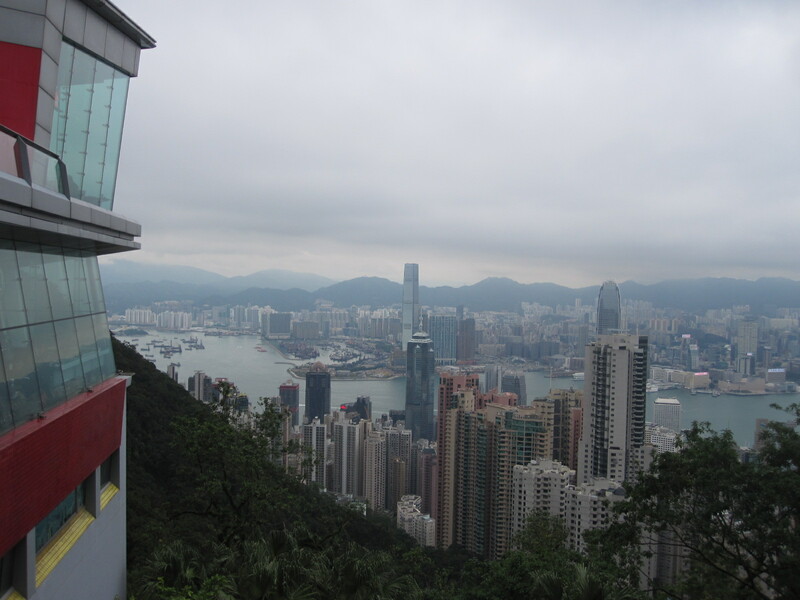 It consists mainly of Hong Kong Island, Kowloon, The New Territories and Lantau Island. The largest of these, by far, is the New Territories, which has a long border with the Peoples Republic to the north, and contains most of the industry as well as some undeveloped countryside. 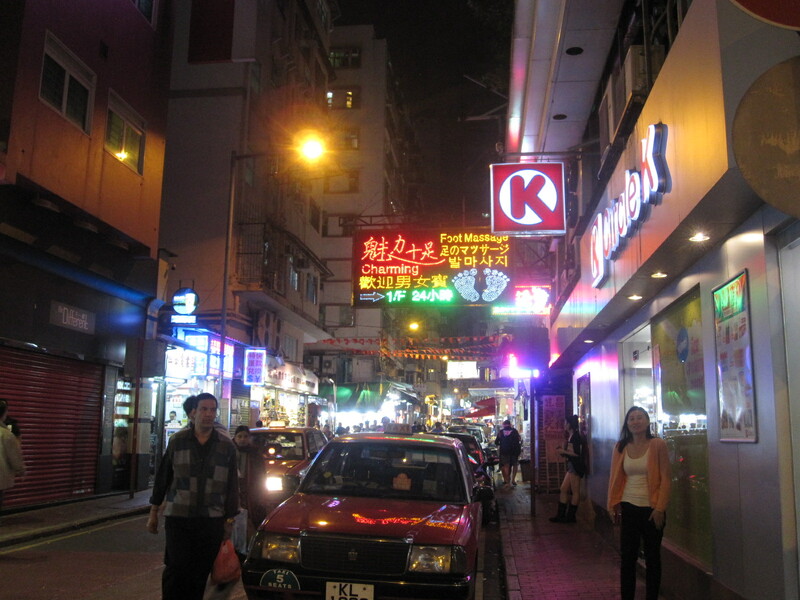 Kowloon is heavily built-up and densely populated, with many shops, hotels and tourist attractions. 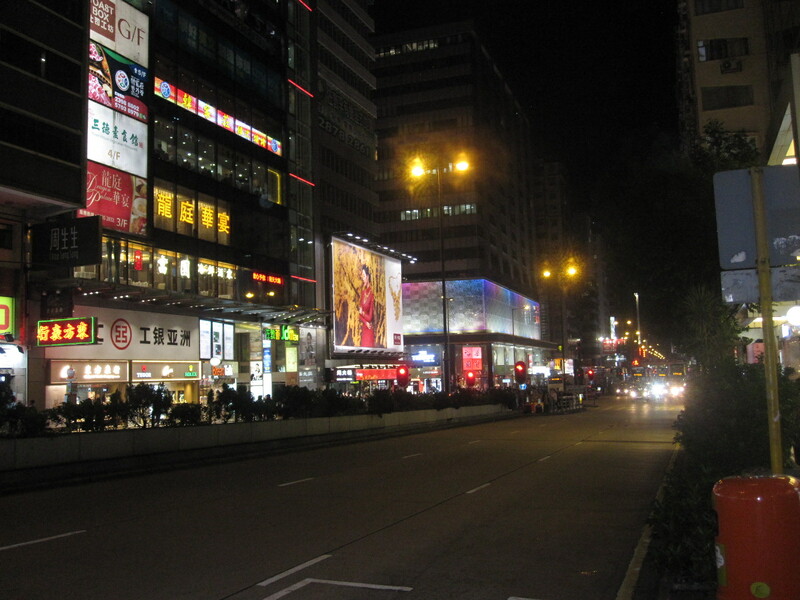 Nathan Road is the main north-south artery in Kowloon. 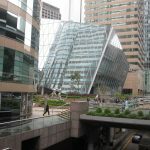 Hong Kong Island has most of the financial centre and big shopping malls but still some areas of countryside and The Peak, a high point providing spectacular views. 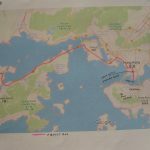 The island is connected to Kowloon by ferries, road tunnels and the Metro system. Lantau Island, with the main airport, is largely quite dense forest and is joined to the mainland by two bridges as well as the Metro system. The city has a fantastic public transport system and at the airport I bought an Octopus card, which is rather like the London Oyster card, and can be used on almost all forms of transport including ferries. The bus was a dedicated airport service, a red double-decker with a rack just inside the entrance for big items of luggage, and as advised by the guide book, I was able to get a seat within view of my case, because they have been known to disappear. The wonderful views did not materialise because it was pitch dark until we got into the lights of the city. The information provided by screens on the bus was excellent and it stopped within 50 yards of the Casa Hotel. 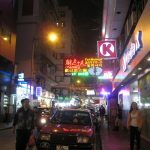 It is easy to imagine that Hong Kong will be cheap, and some things are, but others, such as hotels, are certainly not. 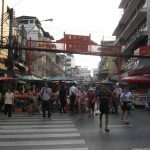 Mid-range hotels are about four times the price of those in Bangkok, and for that you will probably get a smaller room. The Casa Hotel was one of the cheapest in the area, being tall and narrow, with about eight rooms on each floor. I was on the twelfth floor out of fourteen, served by two tiny lifts, which meant that certain times there could be a long wait. It was early Saturday evening, so after getting sorted I went out for a meal. 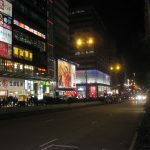 Nathan Road is really a hive of activity, lined with shops and restaurants and all the bright lights you could wish for. Many of the restaurants had menus outside only in Chinese, so I assumed that they just wanted to cater for local customers, and chose one where I could understand what I was getting. In general I like Chinese food but am not at all adventurous and prefer to stick to things that I can recognize. 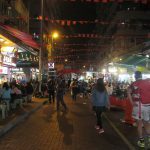 From the guide book I discovered that there was a big night market in Temple Street, which ran behind the hotel, parallel to Nathan Road. Hong Kong has been under Chinese control for 20 years, but as a foreigner you could easily think it was still a British dependency, although the locals would probably not take that view. The street names are still mainly English and the language is in evidence everywhere. They still drive on the left and most of the vehicles on the road are not of Chinese manufacture. The next morning half the shops and restaurants were closed and the ones that were open were crowded but I found breakfast in a nearby café. Afterwards I walked down Nathan Road to the ferry terminal, passing the upmarket Peninsular Hotel which has a fleet of chauffeur-driven dark green Rolls-Royces at the disposal of its guests. As far as I know the Casa does not even have bicycles. The Star Ferry runs a very frequent service across to Central, on Hong Kong Island, with double deck ferries which can be boarded from upper or lower landing stages. The boats are quite traditional with partially open sides and lots of woodwork. On the island side the landing stages are a couple of hundred yards from the buildings, but there are covered walkways which was just as well, because by now it was starting to rain quite hard. 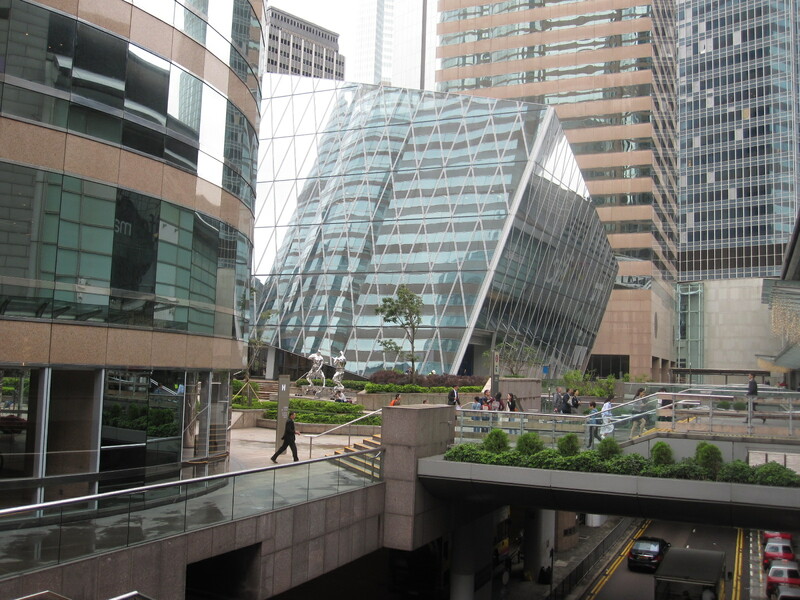 The walkways led into the financial quarter which has big shops on two levels with offices above, reaching very high into the sky. Many of the shops and the offices carry well-known names from the world of luxury goods and finance. As it was Sunday the shops were open and the offices closed. The shopping malls went on and on, with some of the upmarket names being repeated over and again. One Swiss watch company had at least six shops in the complex. My original intention was to go up to The Peak on the famous tram, a cable car that has been operating since 1888 without a single accident, although I suppose there is always a first time. It does not hang from a cable, but is pulled on rails by one. However, by the time I got there it was raining hard and visibility was poor, so I decided to put that off until the next day and go on a harbour tour, also operated by Star Ferries. On the way back to the ferry terminal I passed literally hundreds of young muslim women sitting around in the walkways and other covered areas. They are apparently au pairs working in Hong Kong and meet up every Sunday afternoon for picnics. The “Shining Star” ferry left from one of the Central Piers and toured around the harbour in two large loops, firstly to the east, then to the west via the Kowloon Terminal. Both sides of the harbour were lined with tower blocks, many of them with brightly illuminated names of big corporations, and the English commentary pointed out various landmarks. You can see from the photographs that the weather was dismal. As the trip finished where it started, I had to get another ferry back to the Kowloon Terminal, and find somewhere to eat on that side before walking back to the hotel. In the course of this I got soaked to the skin, which usually happens at some point on all my trips. 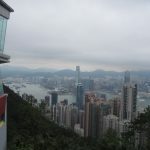 I only had one more day (Monday) in Hong Kong, so that had to be the one for going to the Peak. The weather was better, and to save time I went to Central via the Metro, which I should have used the previous evening. I asked someone the way from the Central Station to the Peak Tram, and was not at all pleased to learn that it was out of action for the day for maintenance. Just my luck. Looking at the map it was clear that it was quite a long way by road, because the roads snake all over the place, but the guide book said it was possible to walk up the hill more directly. 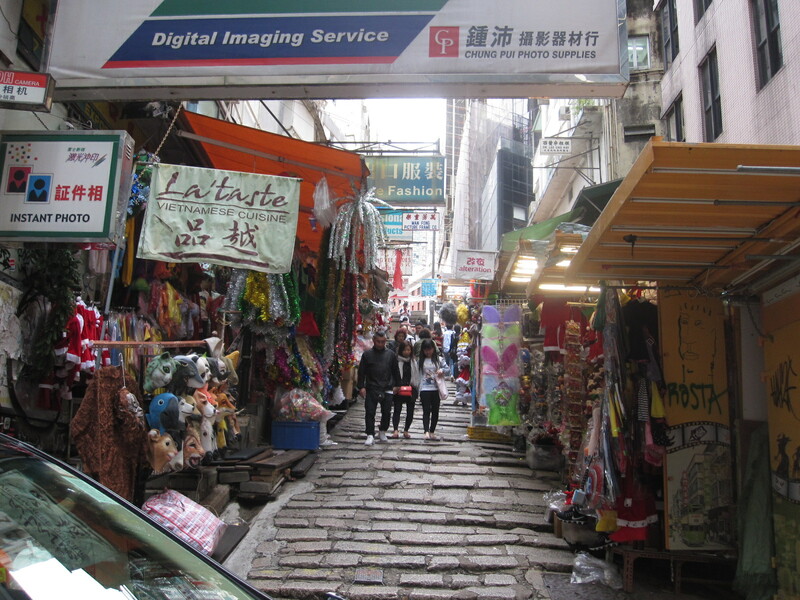 The hill actually rises straight up from the business quarter, and Pottinger Street seemed to be in the right direction. Once you leave the tower blocks the city changes character completely and reverts to the old streets and buildings that were there before the massive redevelopment. It then went past the colonial style former police station and prison before coming out on to a steep tarmac road. At this point I encountered what appeared to be a centenarians’ walking group going down the hill (they certainly could not have been going the other way), a number of incredibly old people supported by able-bodied helpers. It was very strange because it was impossible to see where they had come from or were going to. The road continued to wind its way up the hill with a gradient of about 1 in 4, and when I looked round I discovered that I was still far below the level of the tops of the highest office buildings which were in turn considerably lower than The Peak. 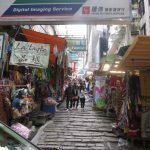 This was all quite ridiculous because I found out afterwards that not far from Pottinger Street was an 800m long escalator, the longest in the world, that took people to a point higher than where I was standing. Anyway, I turned a corner and was amazed to find a taxi depot set into the hillside from where I could get a taxi to the Peak. It took about ten minutes on the road, which I certainly could not have walked. Guess what was at the Peak? Yes, a shopping mall. Before going in I had a walk around and looked at the view, which was superb, although not very wide. There was also an old preserved cable car on display. 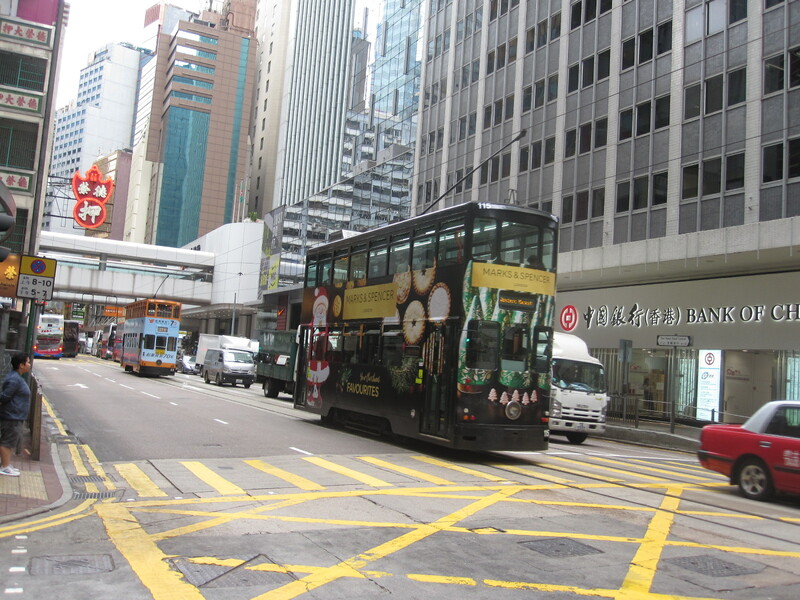 I noted that there was a double decker bus standing nearby on a regular route from Central, and resolved to go back that way. 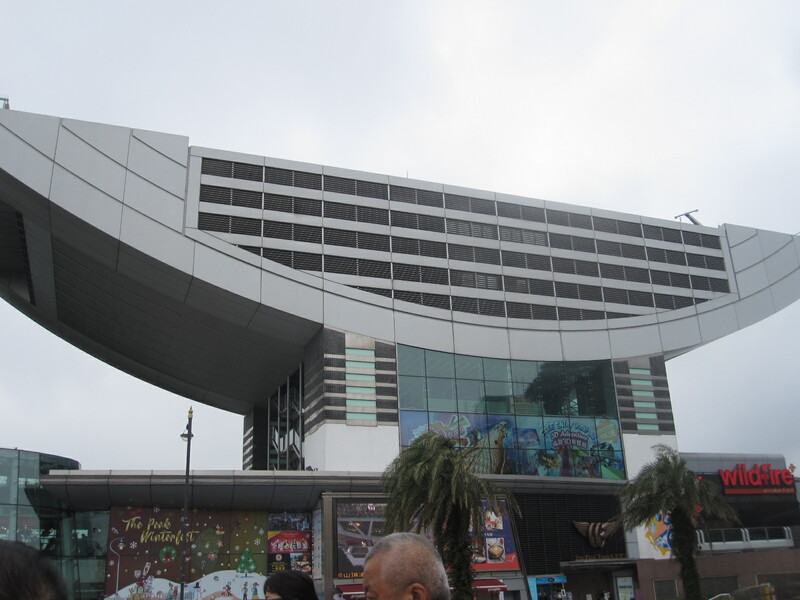 The shopping mall had another rather spectacular building on top of it called the Peak Tower. 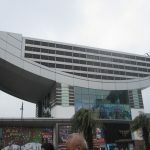 It was not a conventional tower, but had several levels with viewing platforms and entertainment places.including Madam Tussauds. It claimed to have allround views, although it was partially restricted in some directions by higher land. 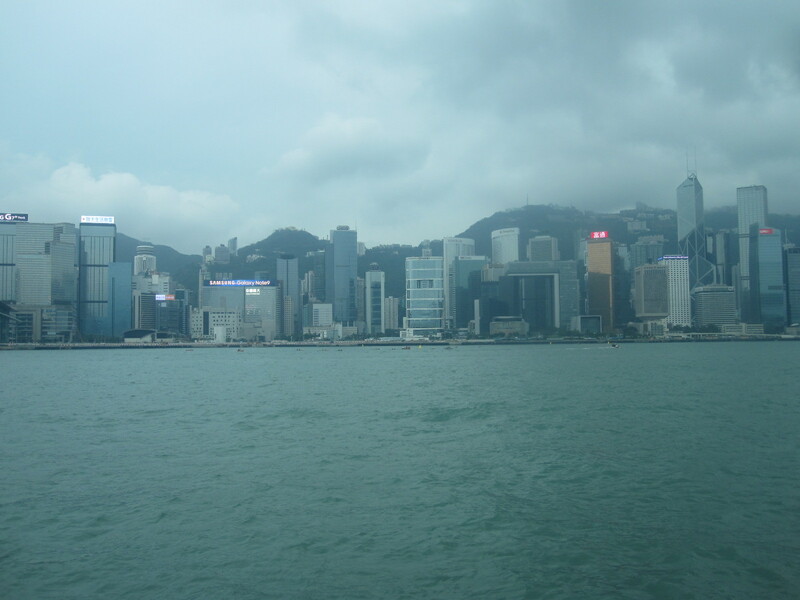 Nevertheless the view of Hong Kong was fabulous. After an exciting meal at Burger King I took the bus down the hill, an unpleasant journey because I had to stand all the way and the bus kept braking hard every time it met something coming the other way. I should have waited for the next one. time looking at the lower part of Temple Street Market, which was brilliant. 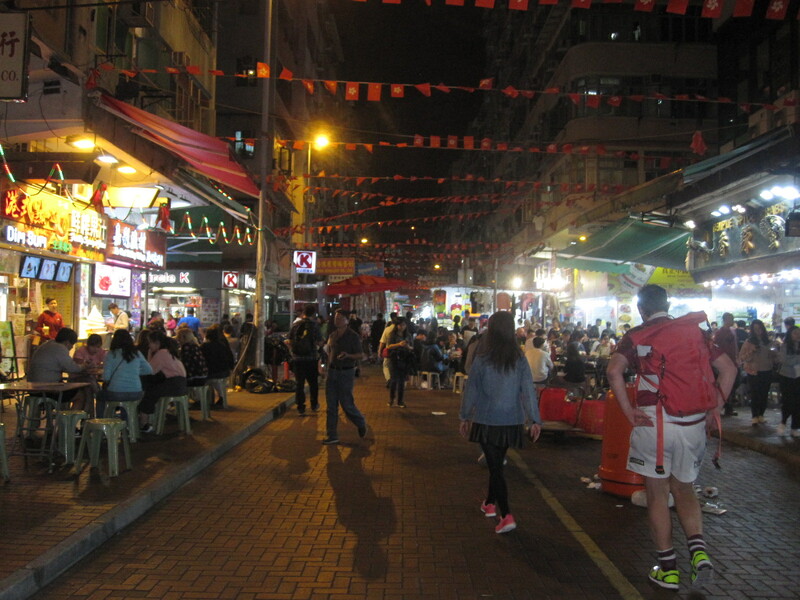 The adjacent streets were a bit seedy with lots of places offering Foot Massage and I suspect rather more. Also booths with fortune tellers. If I had visited them the previous evening maybe they could have told me to be more thorough with planning my trip to the Peak. The next morning I went to the airport on the bus and was able to appreciate the views of the harbour from the bridges. 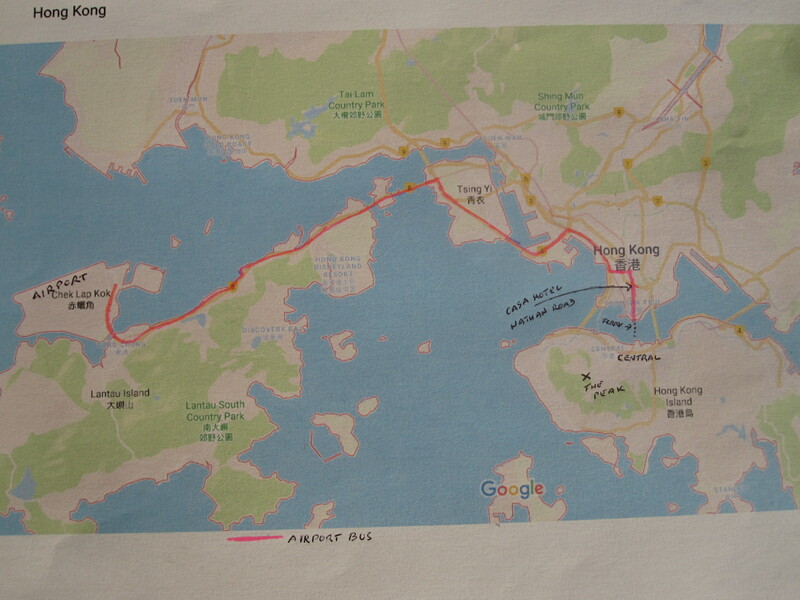 The route also went right past the enormous container port, sometimes said to be the largest in the world and certainly one of the busiest Once on Lantau Island the view changed for several miles to the densely forested hills of Lantau Country Park which provides miles of walking paths away from the bustle of the city. 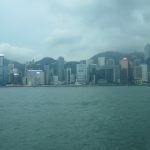 Hong Kong is much larger and more varied than I imagined, and what I had seen was just the tip of the iceberg. One thing I had not seen was the industry for which it is famed, that being mainly in the New Territories and much is brought across from Shenzhen and other big cities in the Peoples Republic just over the border to the north. The Octopus card was very successful, being accepted by buses, trains and ferries, and I was easily able to recover the outstanding balance at the airport before boarding my flight home. © 2019 Bevis Travels. All Rights Reserved.